NEW YORK (CNNMoney) — Iconic investor Warren Buffett announced Tuesday that he has been diagnosed with stage I prostate cancer in a letter to shareholders of his firm Berkshire Hathaway. Buffett, 81, said his “condition is not remotely life-threatening or even debilitating in any meaningful way,” and that additional tests didn’t reveal incidence of cancer anywhere else in his body. Over 70% of men who are diagnosed with prostate cancer don’t die from the disease, according to Dr. Otis Brawley, a prostate cancer expert and the chief medical officer for the American Cancer Society. “The 5-year survival rate for stage 1 prostate cancer is over 99%,” he said. Given that Buffett’s cancer is in stage 1, the lowest stage, it has not spread to outside the prostate and has not yet spread to lymph nodes. Buffett said he will undergo daily radiation for two months beginning in mid-July, a decision made with his doctors. While the treatment will restrict him from traveling during the period, Buffett said his daily routine will not otherwise change. Buffett has made a name for himself by turning Berkshire Hathaway into a successful investment firm. Berkshire owns more than 80 companies, including insurer Geico, chemical company Lubrizol, railroad company Burlington Northern Santa Fe, and MidAmerican Energy. The firm also boasts major investments in such companies such as Wells Fargo (WFC, Fortune 500), IBM (IBM, Fortune 500), and Bank of America (BAC, Fortune 500). Thanks to Buffett’s envied eye for value, Berkshire Hathaway has managed to handily beat the performance of the S&P 500 for 39 of the 47 years he’s been running the company, averaging nearly 20% annual growth. Buffett also said that two investment managers who recently joined the company, Todd Combs and Ted Weschler, “will be handling a few billion dollars in 2012, but they have the brains, judgment and character to manage our entire portfolio” when he and Charlie Munger, Berkshire’s vice chairman, are no longer running the company. Buffett’s son, Howard, is in line to follow as chairman of Berkshire Hathaway upon his father’s death. Howard will not, however, be involved in strategy or day-to-day decisions, the elder Buffett told CNNMoney in December. 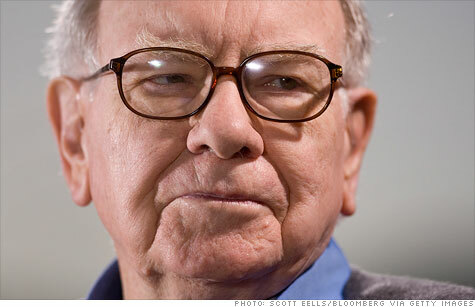 Most recently, billionaire Buffett has been in the spotlight as Washington lawmakers consider comprehensive tax reform. President Obama has been touting the Buffett Rule, which proposes that millionaires and billionaires like Buffett shouldn’t pay a lower percentage of their income in federal taxes than middle-class households. Rather, it says they should pay at least 30% of their income. A proposal to implement the Buffett Rule was blocked in the Senate on Monday, but proponents of the millionaire tax vowed to keep the issue alive in the months ahead. Shares of Berkshire Hathaway (BRKA, Fortune 500) slipped 1.5% in after-hours trading Tuesday, following the release of the shareholder letter. ← Is Microsoft still a competitor against rivals?